Conference Facilities South Africa has a comprehensive list of conference venues and centres with conference facilities in the Grass & Wetlands region of the Mpumalanga Province in South Africa. 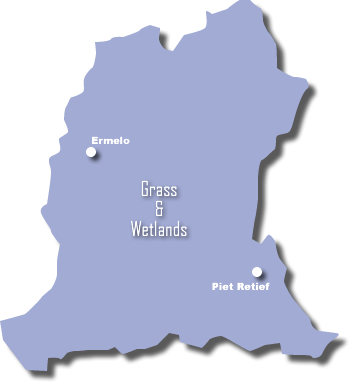 The Grass and Wetlands region of Mpumalanga in South Africa is located in the south eastern part of Mpumalanga and shares its borders with Swaziland, KwaZulu Natal and the Free State provinces. The attractions of the Grass and Wetlands region include hundreds of lakes, rock formations and splendid scenery of the mountains in the area. It is also an historic region of South Africa and many battles were fought here. The Grass and Wetlands region of Mpumalanga also has Bushmen paintings as well as the lost legoya nation's huts that are still standing after a thousand years. Bordered in the south by KwaZulu Natal and in the east by Swaziland, the Grass and Wetlands region of Mpumalanga in South Africa is a birding paradise and popular destination for bird watchers all over the world. South Africa's largest freshwater lake at Chrissiesmeer is situated in the Grass and Wetlands region. Chrissiesmeer also boasts a mysterious giant footprint in rock that matches one in Canada, and hosts an annual frog watching festival in summer and stargazing festival in winter. There are a number of sites of historic interest in the vicinity of Chrissiesmeer including the Dumbarton Oaks Hotel. The Mpumalanga Grass and Wetlands region town of Wakkerstroom is home to numerous lakes and pans where hundreds of flamingo can be seen. This region of Mpumalanga is also an important farming and forestry region in South Africa. The south eastern region around Piet Retief is an important center for the timber industry, with woodworking developing as a secondary industry. The Grass and Wetlands region of Mpumalanga offers a host of outdoor pastimes such as fishing, sailing, boating, water-skiing. Some of the more unusual activities include “frogging” expeditions and stargazing weekends. There are numerous venues for 4x4s, quads, horse trails and hiking, and for exploring Bushman rock art.